Newly appointed Acting Deputy Executive Director FlorabelleUy-Yap thanks Executive Director Ariel Cayanan and the entire NAFC for their warm reception. A 12-year practicing lawyer takes the post as the acting deputy executive director of the National Agricultural and Fishery Council (NAFC), poised to aid Executive Director Ariel T. Cayanan in steering the agency to perform to its fullest. Atty. 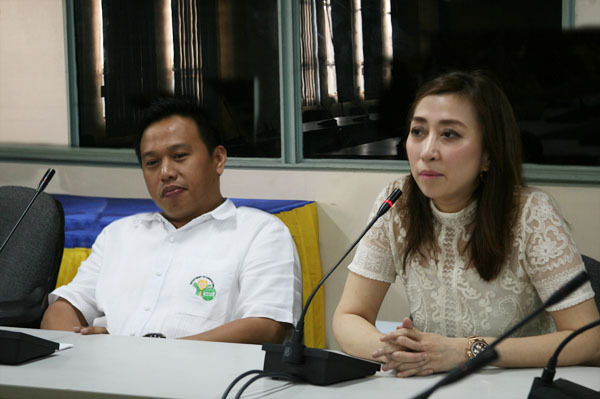 Florabelle U.Uy-Yap, 37, fills in the second highest seat in the agency after her March 5 appointment by President Benigno S. Aquino III through the auspices of the Office of the Secretary of Agriculture. On March 14, 2013, the entire NAFC family welcomed their new leader, two days after she took her oath of office with Department of Agriculture Secretary Proceso J. Alcala. In his message, Exec. Dir. Cayananassured Atty. Uy-Yap that they can rely on the capabilities of the NAFC workforce in fulfilling the mandates of the agency. He also looked forward to working hand in hand with Atty. Uy-Yap in addressing the challenges the agency is and will be facing. “Among the major challenges that I want both of us to focus on right now is transparency. We should be able to address the issues on our liquidation. Also, I hope that we will be able to really focus on our specific mandates and deliver the service that is expected of us. Anyway, this is just the beginning. We are expecting a longer functional relationship with Dir. Yap,” Exec. Dir. Cayanan said after formally welcoming his deputy. Atty. Uy-Yap is the daughter of the former mayor of San Narciso, Quezon, the late Juanito K. Uy, and Eleanor U. Uy, who now serves as the mayor of the said town. At present, Atty. Uy-Yap serves as the director of the Quezon Electric Cooperative 1 representing District 12, which is comprised of Buenavista and San Narciso municipalities. When she started her career as a lawyer in 2000, she worked with the Privatization and Management Office of the Department of Finance as one of its litigators. She also served as the division chief of the Legal Department of the Presidential Commission on Good Government (PCGG) from October 2005 to April 2006. Even as she decided to become a private practice lawyer, Atty. 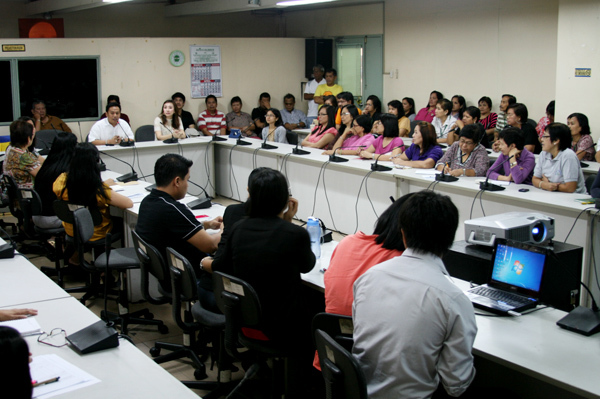 Uy-Yap continued to work with the PCGG asa special legal counsel. When she’s not busy fulfilling her professional duties, Atty. Uy-Yap is giving her full attention and energy in taking care of her son and two daughters. NAFC employees gather at the Apacible Conference Room to welcome the agency’s new Deputy Executive Director. “Upon arriving here, I immediately felt the very warm welcome and for that, I’m so glad to be here. My being appointed as the Acting Deputy Executive Director of NAFC is an opportunity and a privilege for me. I thank the President and the Secretary for the trust and confidence they’ve bestowed in me. But, of course, we cannot do any changes, improvements or developments and (achieve our) goals without your support and cooperation, especially that you’ve been here and you have the expertise and know-how,” she told the assembly of NAFC employees. “I really look forward to your cooperation and support and I can see that we’re going to have a harmonious relationship. The feeling that I’ve gotten here so far is that this agency is one big family. With the help of God Almighty, we’ll be able to help make things better and maybe improve, if there’s still room for improvement, for us to be able to help the President and the Secretary in implementing their goals and aspirations for our country and our countrymen. Hopefully, I can be of service to you, to everyone of you and to the agency,” she concluded. Atty. Uy-Yap succeeds former Deputy Executive Director Noel A.Juliano who served the agency for over two years.